I was driving to go shopping the other day when I turned off the radio in my car. I'd left the house just before 1pm so it was almost time for ads and the news; they were playing a pretty terrible song anyway so I thought I'd save myself listening through all of that. It went quiet. Inevitable consequence, really. In the year or so I've had my car I honestly don't think I've ever driven alone without the radio - it was so quiet it was striking. More like a yell. I'd come to a stretch of road just after crawling through the village at 30 miles and finally I could go 60, a bit like when you've been sitting on a flight too long waiting for the cabin crew to disarm the doors and then you walk off the shoot into the airport and just walk, really fast, even if you have nowhere else to go. Just to test your legs and make sure they still work, really fast? That's what I always do at that point. Test the pedals, just to make sure they work. Really fast, after all that crawling. I could hear the mechanical whir of the engine, a heady thrum of the Mini's electrics doing their thing. Tyres over the bumps in the road. A sort of cher-chunk when I eased my foot off the brake. A background murmur, as the car was buffeted by wind over the open heath on both sides of the road. It was one of those perfect Norfolk afternoons; a few strands of liquid cirrus clouds, spilt milk on a toddler's table, the sky Malibu blue, so much so it fades to gray over a hazy horizon. The beech trees that delineated fields swayed enthusiastically, sheep grazed in said fields, a tractor ploughed. But it felt different. It wasn't just a Norfolk summer Thursday afternoon without the radio. It was a transplant of some kind. I was in France, maybe, in some region so rural we couldn't find a radio station that actually played. We'd been there before, many times, same thing, different places. I remember a few years ago we rented a caravan and toured the center of the country for the week, we were somewhere in the heart of the Loire where RTL waves didn't reach. We had parked the truck on a green outside a village under a castle, we were by a lake eating off a plastic table on unreliable plastic chairs, sourdough baguettes. I bit into a local peach, it was the juiciest and sweetest I've ever had, the juices dripped down my wrist but I didn't feel like going into the truck to wash it off, so I just sat there with a sticky hand in the hot sun, trying to lean back in the rickety chair, unsteady on the rough grass of that green. The radio silence lasted me along that single lane in the heath and onto the two lane highway towards town. We used to drive over to England from Belgium and there was always this awkward patch of land around Kent and Essex where the radio would just sort of cut out, and my dad would put on BBC radio 2 instead, since it plays everywhere, and I hated it. The annoying channel switches would have started somewhere around Calais in France, but the French always seem to play decent music so that was ok. It was worse in England where in general the music was far less ok. But the first part after you disembark (from the Channel Tunnel) was bearable, despite the music, because back then England was a novelty, and it was fun seeing everyone drive on the wrong side of the road, there were these green fields, sort of hilly, with white chalk underneath, and they'd be filled with horses. Thousands, all colours, just take your pick and it would be there, like types of coke in a vending machine. There was this one rest stop where we'd break journey for a while, and the sun would be blindingly bright, the wind sharp as a slap, and we'd always say how the weather would just visibly deteriorate as we headed North. We were almost always right, but I never remember having a bad time. I was almost at the grocery store by now but I didn't turn on the radio because I was stuck in a thought. I was thinking about that kind of silent city ride in a taxi. There have been so many, mostly in Asia. Not because we don't take taxis in European cities but because their drivers seem to like the radio. In Asia they don't, or not with passengers, something like that. There'd be tired, sagging leather seats sticking to the backs of sweaty legs, feet with blisters. Window down, the heat inside when the car was idling would be so thick you could cut it with that proverbial knife, but you wouldn't be bored, because Asia has a habit of carrying on life outside of closed doors for the benefit of those stuck in sweltering taxis. Sometimes the cabs had AC, which was better, especially since most of those times I'd be wearing jeans and a sweater and we'd be heading to an airport on a tropical highway, which means the possibility of potholes and debilitating traffic jams and errant cows, and feelings would be mixed. It would be Europe, which would be home. Which could be good. If we lived in Asia then it was nice to drive on highways that were free of cows and potholes. But it could mean that's it, the end of the tropical highway was really the end of the tropical highway since the holidays were over and rainy winter loomed on the other side with piles of school work and a freezing cold house. We could contemplate it, either way. Like leaving something to cook in the residual heat on the stove. We could sit and think, stew it out, in the silence in the back of the cab, without the radio. I'm told quite often I'm a quiet person. I don't talk as much as people expect me to, considering I'm 18, female and spend an unreasonable amount of time getting ready in the morning. I prefer to listen, is what I usually say. Listen hard enough and my thoughts seem to take me back, snapshots, times and places and feelings I thought I'd misplaced. A lot to fill the emptiness; it overflows. 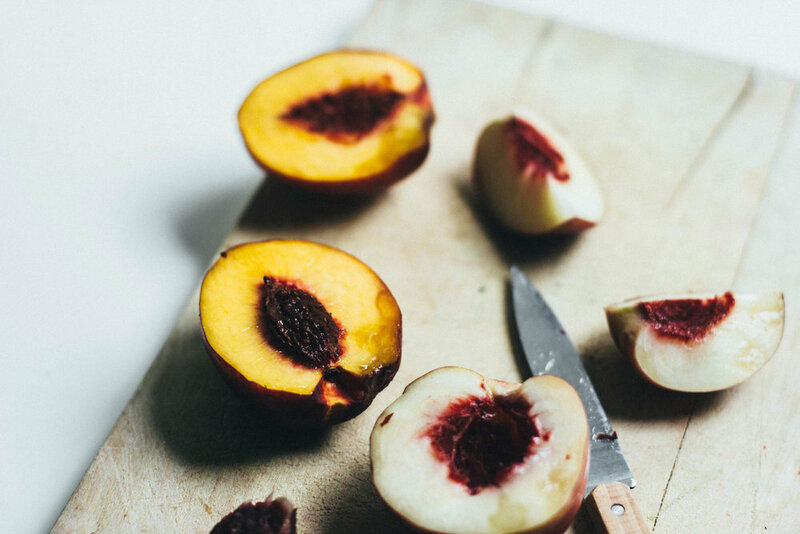 I hope that you're all not too tired of stone fruit yet because personally I could eat them year round and I'll proceed to eat peaches and nectarines until they disappear from the shelves. I'd intended to make a peach cobbler but we only had nectarines, so be it. You could of course use peaches if you'd like. Not the most glamorous dessert, maybe, but the fruit really doesn't need much dressing up to be pretty gorgeous. I mean, just look at the colours of those nectarines. Hope that you're enjoying these sort of Indian summer days, this has got to be one of the nicest times of the year - cool mornings and evenings, mild days, sun still warm. Preheat oven to 180'C, 350'F. Rub a little coconut oil around the sides of a baking dish with around 2L (2 quarts) real estate. An 8x8 square pan would work. In a medium bowl, whisk together all the dry cobbler ingredients. 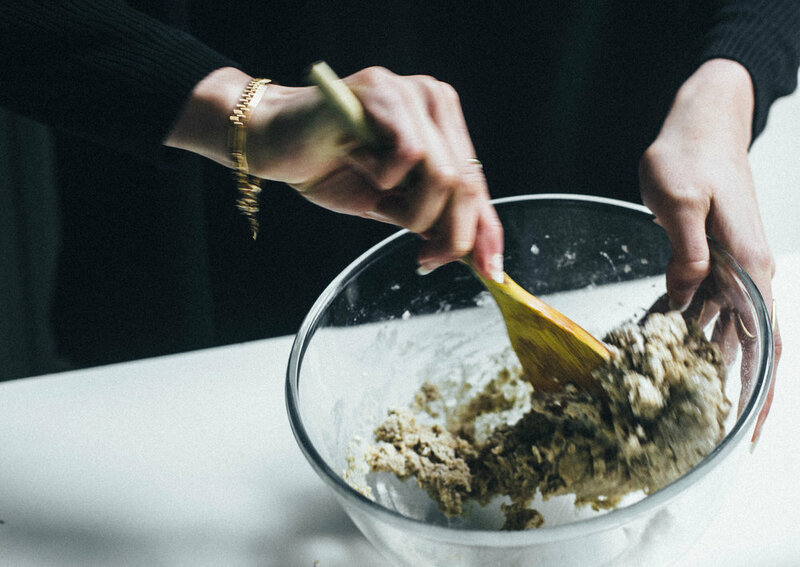 Add the honey, vanilla and and oil and mix through with a fork until the dough looks, well, dough-y (like cookie or scone dough). Set aside. Chop nectarines into slices and chunks - no need to peel but you can if you prefer. 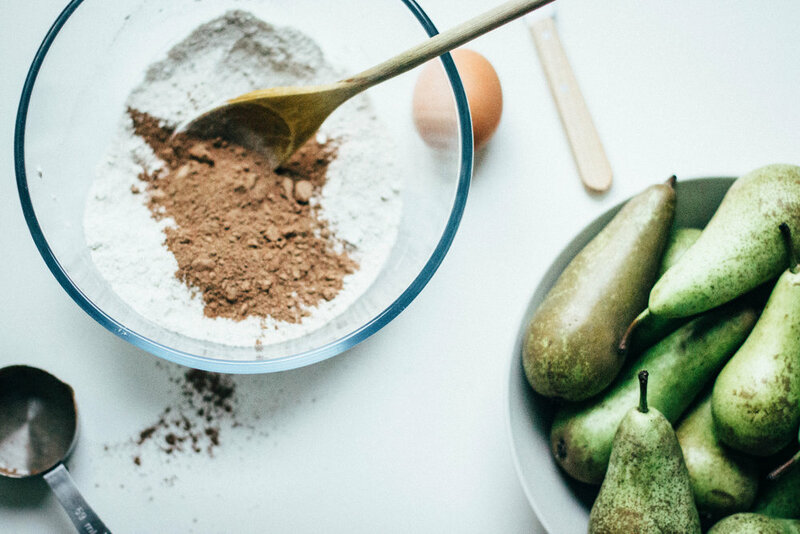 In your baking dish, drizzle the lemon juice over the sliced fruit, toss with the arrowroot and sugar. 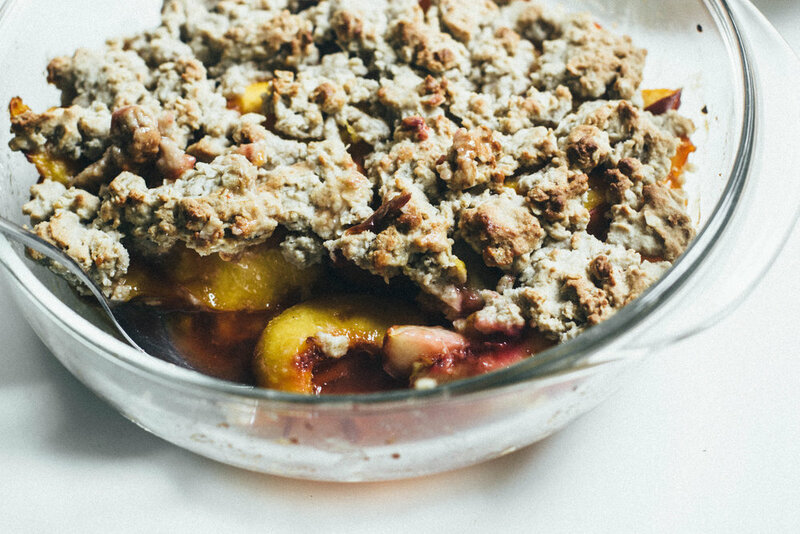 Top the nectarines with the cobbler - drop blobs, for want of a better word, over the filling. Not so glamorous. Bake for 25-30 minutes, until the cookie blobs (sorry) are golden and the filling is bubbling. You can keep the whole dish in the fridge for a couple of days and serve cold or warm, as you prefer. Some people like ice cream with these things, if that's you, go for it. As a heads up, if you do keep the cobbler, the biscuits will soften from the fruit juices but it will still taste pretty amazing.